The Center for Watershed Sciences had a project to model various scenarios for land restoration in the Cosumnes River floodplain, largely in the context of the Swainson’s Hawk. Toward the end of the project, we wanted to develop a decision support tool to help the grantor better understand the results, but had a small budget for this task. 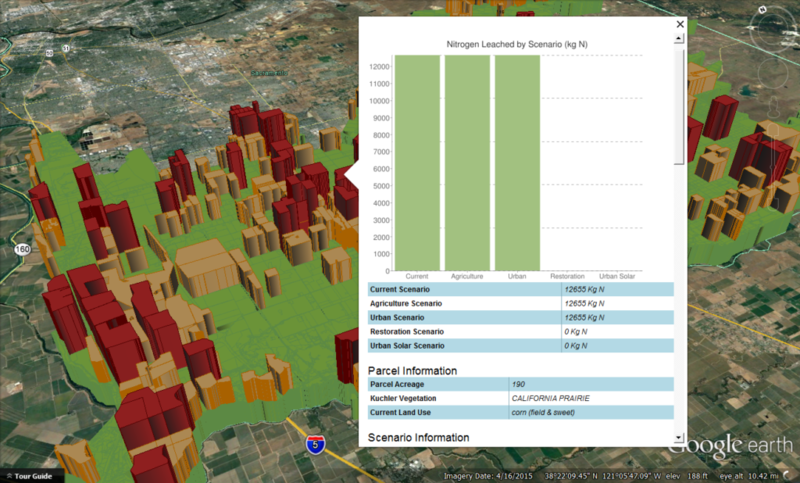 We turned to building some advanced Google Earth KMZ files that show the results, visualized in 3D and with detailed popups that show all of the results, along with graphs for relevant parameters that show the differences between scenarios. I built attribute values in ArcGIS, and built the popups, along with charts partially in ArcGIS and partially with scripts that performed edits on the exported KML files to add in charts using Google’s charting API. We ultimately delivered around 40 KMZ files containing 2D and 3D visualizations of the data for multiple variables and scenarios.